At Dr Bensimon’s Family Dentistry we have a wonderful group of highly trained hygienists who optimally manage your oral health. Our staff receive regular advanced education in managing your oral health. We can treat your needs in total comfort covering all ranges of health issues from gingivitis to advanced periodontitis (gum disease). Our dental hygiene department emphasizes preventative care. We encourage the use of topical fluoride at regular cleanings for children and adults to help strengthen teeth and to reduce or eliminate any sensitivity. Our office performs an analysis of not just the teeth, but also the gums and bone. The dentist and hygienist will perform a thorough evaluation of your teeth and gums through the use of screening x-rays, gum measurements, oral cancer screenings and jaw joint evaluations. 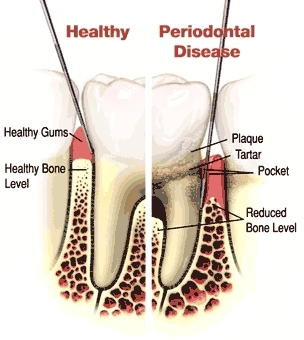 A periodontally healthy patient is one whose gums don’t bleed with brushing and flossing. If your gums bleed, it may be a sign of the beginning stages of gum disease. Gingivitis is a milder and reversible form of periodontal disease that only affects the gums (not the bone). It develops as toxins in plaque and tartar irritate gums, making them red, tender, swollen, and likely to bleed easily. It can usually be eliminated by daily brushing, cleaning between your teeth, and regular dental cleanings. Gingivitis may lead to more serious, destructive forms of periodontal disease, called periodontitis. There are several forms of periodontitis, with the most common being chronic adult periodontitis. Periodontitis occurs when toxins, enzymes, and other plaque byproducts destroy the tissues that anchor teeth into the bone. The gum line recedes, which can become susceptible to decay and sensitive to cold and touch. Also, the gum “pockets” deepen, which may indicate that a detailed cleaning below the gumline is necessary to remove the tartar deposits and bacterial colonies that form on the tooth root surfaces. In most cases, we can comfortably anesthetize the patient for this procedure without a needle! We may also recommend local antibiotic therapy which is gently placed below the gumline to sterilize the “pocket” and assist in healing the infected area. We work with you to give you the tools and the knowledge necessary to care for your teeth and gums at home to prevent future problems with gum disease. But best of all, we have laser assisted periodontal therapy to help heal periodontal inflammation to give you ultimate periodontal health. Depending on your level of periodontal health, our office will make a recommendation as to how often your teeth should be professionally cleaned, and what type of cleaning is most appropriate for you. But best of all, we have laser assisted periodontal therapy to help heal periodontal inflammations to give ultimate periodontal health.